Texas wages a war on drugs at the border. That might be the wrong place. An estimated 1.6 million adult Texans have substance use disorders, many addicted to drugs that arrive illegally from Mexico. The Texas Tribune is taking a yearlong look at the issues of border security and immigration. In this part of the project we look at how our insatiable demand for illegal drugs and cheap labor make the border less secure. Sign up to get story alerts. CORPUS CHRISTI — Conrad Ruiz’s life flew by in months, not days. He began using methamphetamines in his early 30s after his world morphed from living with a partner and child to a party lifestyle. Using turned into dealing, then dealing turned into transporting drugs smuggled in from Mexico. While he was high on drugs, money and danger, his life sped by. "For me it wasn't Monday, Tuesday and Wednesday." Ruiz, now 40, said in a meeting room at Charlie’s Place, a converted hotel that serves as a popular drug treatment center in Corpus Christi. "It was January, February, March, and they'd fly by just like that." Eventually caught with counterfeit money, he was sent to federal prison for 15 months. He got clean on the inside, but at the end of his sentence he was sent on his way with nothing more than a tip to go to some Alcoholics Anonymous meetings. He soon fell back into his old life and was picked up on a possession charge in Nueces County in late 2016. Instead of being sent back to prison for violating his probation, Ruiz was offered the chance to undergo drug treatment, an option he never knew existed before. Conrad Ruiz tells how Charlie's Place helped him with his addiction. A political shift is underway in the United States over the best way to deal with addicts like Ruiz. The once prevalent zero-tolerance, throw-them-in-prison approach is softening as a growing number of Republicans and Democrats call for treating addiction as a disease rather than a as crime. And while President-elect Donald Trump's statements have focused more on stopping drugs from crossing the southern border than on treating addiction, he’s also laid out a vague plan to address the drug epidemic, including expanding drug courts and treatment services. But Texas' elected officials, and its legislature, continue to place more emphasis on border security than on drug treatment — working to cut off the supply. Critics of that approach claim shifting more money to treating addiction would reduce the demand for drugs, theoretically giving Mexican cartels less incentive to smuggle their wares into the country. In 2015, Texas lawmakers ponied up $800 million for border security – boots, guns, cars and troopers on the ground – but set aside about $90 million for voluntary drug services, though the treatment pool is boosted with federal dollars. Of the estimated 1.6 million adult Texans with substance use disorders, almost 700,000 qualify for state-funded care based on financial need, according to the Department of State Health Services. But only about 6 percent of those who qualify receive treatment, and wait times for those wanting help average about two weeks and sometimes stretch into months. About half of those who enter voluntary treatment complete the program. The criminal justice system received much more — nearly $300 million — in state funds to provide drug treatment services for convicts. About 8,000 beds within the Texas Department of Criminal Justice are set aside for programs to help treat people either during their time in prison or as an alternative to prison, according to the department. Though treatment isn’t always successful, data suggests that those offered the services have a lower chance of finding themselves back in the system. For convicts entered into one TDCJ drug program, the chance of being reincarcerated after three years is 20.5 percent. Similar inmates who weren’t in the program had a 37.9 percent chance of recidivism, according to the corrections department. There is a cost benefit when treatment is successful as well, according to Murthy, the surgeon general. His addiction report cited studies indicating that for every dollar spent on substance use disorder treatment, $11 is saved in health care and criminal justice costs. But in Texas, treatment isn’t the norm — most people caught with drugs still cycle through the regular jail and prison system. The Texas Department of Public Safety reported more than 117,000 people were arrested on drug possession charges alone in 2015, and in September, almost 9,000 whose only offense was possession sat in prisons or state jails without treatment, according to TDCJ. And every day — while thousands of addicts sit in prison — Texas troopers patrol the southern border looking for drugs, and people like Ruiz prowl the streets with the same objective. Texas has more prisoners than any other state and has the fourth-highest imprisonment rate in the country, according to statistics from the Bureau of Criminal Justice. Often, those with substance abuse issues repeatedly cycle through the justice system — sent to jail after being nabbed with drugs, then released into the same environment. Meagan Shealy was one of those people. In an eight-year span, she faced charges 11 times in Houston, all for prostitution or drug possession. In 2012, at age 25, she was pregnant with her sixth child and had just been arrested again on a prostitution charge, only nine days after she was released from a seven-month stint in state jail. It was a regular occurrence for Shealy, but this time instead of sending her off for more jail time, her lawyer asked if she wanted help with her drug addiction. Shealy’s lawyer got her into the STAR Drug Court Program, one of about 50 adult drug courts throughout the state that puts repeat, nonviolent drug offenders through a mandatory treatment program as an alternative to jail. Those who qualify and volunteer to participate, like Shealy, are assigned an individualized treatment plan typically lasting eight to 12 months in which they learn about addiction and living without drugs. “It’s a probation, but it’s a very structured and very intensely supervised probation,” said Mary Covington, who runs STAR. Shealy struggled at first. She had been using drugs and selling her body since she was 12 years old. It was all she knew. She relapsed twice, but her recovery coaches at the treatment center went to court and advocated that she be sent back to treatment instead of jail. In November — four years after beginning treatment — she successfully completed her program. She's been clean for more than a year. She’s now working at a cafe in Houston’s Hermann park, and she just moved out of a long-term treatment home for women into her own apartment. She has lost the rights to five of her six children but hopes to win back her three-year-old boy, the one she was pregnant with when she entered STAR. Studies have shown that drug courts, which are mandatory for all Texas counties with a population over 200,000, considerably lower recidivism rates, but there are limited openings. In Harris County, about 6,000 adults every year face nonviolent drug charges, but only about 250 will go through STAR this year, according to Covington. 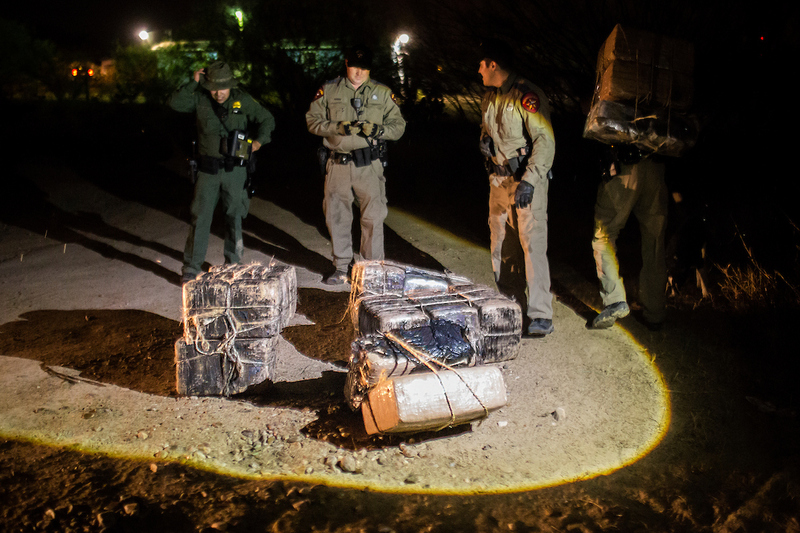 One thing is clear — as long as there’s a profit potential, cartels will find a way to transport drugs and other illicit items over the border. But while there's growing agreement that treatment is a viable option for drug abusers, debate still rages over whether the state should prioritize getting Texans off drugs or cutting off the flow. For Kelly, the answer comes down to simple microeconomics. Reduce the demand and the supply will dwindle. This means prioritizing treatment over border security. That’s not to say border security efforts should be ignored, Kelly said, but he recommends spending about three dollars on reducing demand for every dollar spent attacking supply. But others, like David Murray, a drug policy expert at the Hudson Institute, a conservative think tank based in Washington, D.C., don't buy that approach. Easily available drugs become more acceptable, and the perceived risk of using them goes down, he said. While Texas has seen recent increases in methamphetamine usage, it hasn’t seen the same rise in heroin and opioid usage that has plagued much of the country. What puts the state at risk, Murray said, is its proximity to Mexico, as drugs funnel through the state into the rest of the country. “So you’re at risk for smuggling and trafficking and for the presence of cartels operating in the state, but the state residents are not at high risk compared to other states for use,” Murray said. Texas Sen. Charles Schwertner, R-Georgetown and chair of the Senate Health and Human Services committee, advocates looking at treatment and border security. “We need to have better treatment facilities for those addicted to substances ... and we need to have better enforcement on the border regarding illegal entry of narcotics across our southern border,” he said. Texas has made some changes tempering its tough-on-drugs approach. After the 2015 legislative session, Gov. Greg Abbott signed a bill allowing lower-level, first-time offenders, including drug users, to seal their criminal records if they complete their sentence and don't commit a violent or sexual crime. He also signed into law a measure allowing people to buy an anti-overdose drug over the counter. But he vetoed a bill by Rep. Ryan Guillen, D-Rio Grande City, that would have provided a defense for those prosecuted for possessing small amounts of drugs while seeking medical help for an overdose victim. It’s unclear what the 2017 session holds for drug policy, but on the first day of bill pre-filing, several relevant bills were thrown in the hopper. In addition to Guillen refiling his bill, Rep. Harold Dutton, D-Houston, filed a bill to change the penalty for possessing small amounts of certain controlled substances to a class A misdemeanor, rather than a state jail felony. Another filed by Rep. Ina Minjarez, D-San Antonio, expands who has to pay certain costs on convictions meant to support drug courts. On the other end of the spectrum, Texas legislators originally indicated they might consider upping funding for border security to $1 billion, but now many think a Trump presidency could see more federal money flowing to the border, supplanting state money. "We’ve been spending a lot of state resources on issues associated with the border and border security ... so I look forward to maybe holding back on some of that money, actually,” Schwertner said. Whatever happens this session, there is an understanding among drug policy experts that there will never be enough money to help everyone suffering from drug addiction. When Conrad Ruiz was dropped off at Charlie’s Place in October, he made his dad circle the blocks several times while he worked up the courage to go inside. “That first time around, he went round the block. I told him to go back round again, you know, because I didn't know what to expect,” Ruiz said. “Finally he stopped, of course. I said, 'Go back round one more time.' He said, 'I'm not running out of gas for you.'" Charlie’s Place occupies an old Ramada Inn, and Ruiz’s room reflected that. It still had red, green and gold hotel curtains, a full bed, dresser and a small vanity filled with greeting cards and pictures sent from his loved ones. His days started at 6:30 a.m. and were filled with group sessions teaching life skills like nutrition and exercise, lessons on addiction and rigidly scheduled meals and recreational time. The center runs like a well-oiled machine. Ruiz is one of the lucky ones. Since he was sent to Charlie’s Place through a federal probation program, he didn’t have to wait to get in and was able to receive the treatment he needs. Many aren’t so fortunate. Just outside of the center’s residential area on a typical morning, four men sat in the lobby with trash bags or duffel bags filled with their belongings, fidgeting restlessly or staring straight ahead, hoping for a spot to open up. Addicts seeking a state-funded bed at Charlie’s typically wait six to eight weeks, Granberry said. Most service providers use a combination of funding, taking in both indigent clients who qualify for free state coverage and those able to pay through other means like insurance or private pay. About 30,000 adults receive substance use treatment services a year in Texas, costing about $1,700 per person, according to a 2015 DSHS report. It’s unclear how many of those people are using state-funded treatment options. The state requires that it be the last resort for payment options, but many clinics say the majority of their patients qualify for state-funded care. But sometimes it’s not cost effective for clinics to set aside beds for the indigent population. The state often pays clinics less for care than it actually costs to treat them. Ruiz completed his treatment the day before Thanksgiving. He's continuing to work on staying clean and looking to get a recovery coach to help him while he faces his outstanding legal issues. "It's going great," Ruiz said of his recovery two weeks after leaving Charlie's. "I have no urge to use, nothing like that." This story is part of Tribune's yearlong Bordering on Insecurity project. Clarification: An earlier version of this story said Gov. Greg Abbott signed a measure that allowed first-time offenders to expunge their records. The records may be sealed, not expunged, if they complete their sentence and don't commit a violent or sexual crime.